Everybody's Golf 2 once again returns on the PlayStation Portable that feels like anime Golf and actually makes such a dull game quite entertaining as it does not take itself too seriously. 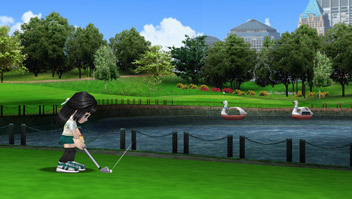 The cute Japanese inspired characters with their large heads and eyes and refreshing gameplay still makes this series one of the better golf games on the market at the moment and best of all, it can be played by a variety of different gamers of all ages and levels. Take on Everybody's Golf fans from around the world and show off your skills in tournaments and head-to-head matches. Six brand new courses and six updated classics, packed with challenging holes and new elements, including tricky green layouts. Perfectly suited to handheld play, whether you're filling time with a few well-placed putts, or ready to head out for a full 18 holes. Although the game contains a decent tutorial, the learning curve of the title is rather low and most gamers should have no problems in playing golf straight away and best of all, the control system is perfectly mapped on the PlayStation Portable. 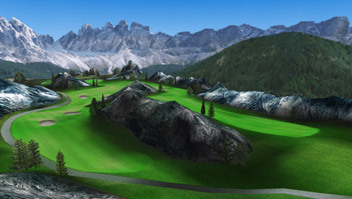 In its essence, Everybody's Golf 2 is still your traditional golf game where you must line up your shot and then hit the ball, baring in mind how hard you have hit the ball and also take into account the weather and wind. Depending on the difficultly level, it can be quite exhilarating or frustratingly annoying but the cute little aspects of the title make it well worth it. For instance, by pressing the Circle button the PSP, this will cause your power meter to rise and the further the meter goes, the further your ball will go and once you are happy with the power, you push the Circle again near the white square at the bottom of the meter which will dictate how accurate your shot will be, whether it goes straight, left or right. Essentially the main factor which will determine how good you are at this game is how good your timing is. Putting is a little different and you still need to take into account the weather and also the slopes of the green in order to put the golf ball into the hole. The game also contains a great mini-golf mode that is like a psychedelic golf course with strange gaming environments but is actually quite entertaining and will assist you in mastering this game. 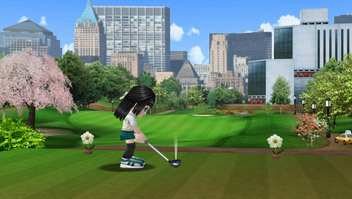 Graphically, Everybody’s Golf 2 is a cute looking game on the PSP with its bright colours and anime looking characters. Although the gaming environments are a little bland, the gameplay and over the top characters make up for this. Musically, the title contains your stock standard Everybody's Golf "sounding" MIDI soundtrack that is cute as the graphics but does get a little repetitive. There is even some voice acting in the title and your usual golf sounds that have been exaggerated for this series. In conclusion, Everybody's Golf 2 can be played by a variety of gamers and even though it is more simplistic than the "professional" golf games, it's good old fashioned fun with great gameplay, good graphics and even supports a multiplayer mode for added longevity. It may not offer the series much in terms of gameplay but it definitely goes beyond its initial incarnation.